The cosy Valentina restaurant serves an extensive array of Italian dishes using authentic ingredients. 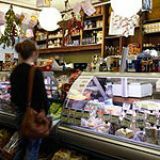 There is also a deli area which offers a fine choice of cheeses, antipasti, olive oils and vinegars. Do you work at Valentina? Valentinas great! They do the most authentic Italian dishes in the area! The millennium trend of dine-in delis is still going strong. Of course, some do it well and some not so well. 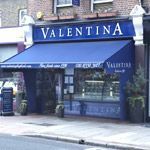 Thankfully, Valentina in East Sheen has proved so popular it’s opened up a sister branch in nearby Putney. 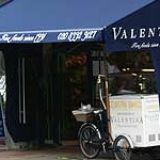 Valentina is a traditional family-run Italian deli on East Sheen’s Upper Richmond Road. Opened in 1991, its faithful customers were so overwhelmed by its delicious produce it seemed rude not to offer a sit down option too, and that’s exactly what they did. Beneath the stylish navy canopy sits an old-fashioned ice cream-vending bicycle which no doubt trundles through SW14 flogging gelato during the summer months. Diners make their entrance to the restaurant through the shop, dodging the chubby pink legs of ham and bushels of dried chillies which hang from the ceiling. This quiet, airy space brightened by a vast sunlight overhead is decked out with olive-hued walls, pea green banquettes and dark ash tables. Black and white images of the olden days adorn the walls completing the Italian-diner scene. There is a real homely atmosphere here at Valentina. Faint operatic tunes drift throughout the room, with the squawk of the coffee machine and escalating chatter of locals you could almost be in the back streets of Florence. The staff are friendly and are more than happy to recommend their favourite dishes, all of which arrive swiftly. The clientele is very local with East Sheen and Mortlake residents coming in for a mid-week supper or a leisurely date. The menu here at Valentina is very inviting, luckily you get a few moments to peruse whilst grazing on a basket of homemade olive bread. The antipasto selection includes a fabulous fritto misto (£7.50), a mountain of fried whitebait, fresh squid and topped with a battered king prawn. The accompanying few leaves and a drizzle of syrupy balsamic lightens the fried-ness of this great pile of seafood. Another winner is the capesante pancetta e zafferano (£7.95), pancetta-wrapped scallops in a creamy saffron sauce. It’s a blend of sweet, fat scallop, salty bacon and creamy saffron, although for the price it would have been nice to have more than just three of the tasty fellas. On the primi piatti (first course) section there are seven dishes including a paccheri spacca Napoli (£8.75), homemade paccheri pasta served with a stuffed roll of beef in a rich tomato Neapolitan sauce. On the piatti principale menu (second course) the calamari ripieni (£13.95) is one of those dishes which you will remember forever. Three plump tubes of fresh squid are filled with a piquant mixture of black olives, capers and anchovies, grilled and served on thin strips of ciabatta with a light, tomatoey fish ragu. For more a meatier dish try the tagliata di manzo, (£14.50), peppered ribeye steak served with a wild rocket and parmesan salad. A slab of fine beef with crushed peppercorns is grilled to a perfect medium rare. The grilled asparagus with Parmesan shavings (£2.45) make a good, starch-less accompaniment. With the first two courses being so impressive the dessert selection has a lot to live up to. The canaletto Siciliana (£3.95), a sugary cone of pasty filled with a sweetened ricotta cheese and a sprinkling of candied fruits, drizzled with a sticky sweet chocolate sauce, is okay but it won’t knock your socks off. However, the cheese platter (£5.95) is cracking. A generous plate of five cheeses includes two pecorinos, one infused with truffles and the other with slivers of hazelnut, a melting brie, creamy dolcelatte and finally, a crumbling wedge of parmesan. To top it off, it comes with a small pot of warmed honey, a sprinkling of walnuts and some proper Italian crackers. It is a real treat to have at the end of the meal. The wine list at Valentina is literally endless. You have the choice from the extensive range in the shop at retail prices but with corkage of £3.95 a bottle. This means you have access to some incredible Italian wines at a fraction of the price they would normally cost in a restaurant. The wine list changes frequently, depending on what’s available, so each time you come back there should be something different to grab your attention. The Montepulciano D’Abruzzo Colle Cavalieri is generally the house red, £7.95 retail plus corkage makes it a very reasonable £11.90 a bottle. The Merlot Torresella is typical Italian red, bursting with flavour yet light enough to go with both pasta and fish. If you’re feeling swish then try one of the Barolos starting at £23.95 (plus corkage) going up to a dizzying £159. Other drinks options include the typical Italian aperitif, Campari (£2.25) or if you’re brave enough a glass of Grappa (£4.50) as a post-meal digestive. The coffees are excellent and are hand-pulled from a traditional machine using top quality Italian beans. The espresso here at Valentina is so perky it would wake up the dead. 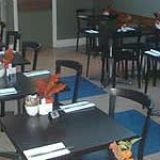 Valentina offers excellent, homely Italian food at a very reasonable price. Its laidback neighbourhood vibe and cheery staff make for a very enjoyable evening. With a new branch in Putney, Valentina is proving to be a worthy contender for the dine-in deli crown.